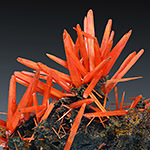 Crocoite is a rare lead and chromium secondary mineral. Its rarity, bright red color, and exceptional crystal forms have guaranteed its place as a prized collection mineral. Crocoite is the first historic source of chromium and natural yellow pigment - unfortunately highly toxic. 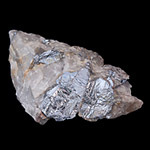 Molybdenite is the principal ore mineral of molybdenum and rhenium. It occurs widely in igneous and metamorphic rocks generated under high temperature conditions. Despite its lack of popularity and rare crystal forms, it is a very interesting and important industrial mineral. 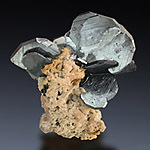 Vivianite is found in many geological environments. 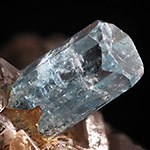 Its great blue-green crystals are very rare and very popular among collectors. Also vivianite filled fossil shells are among very interesting and popular collectors items. 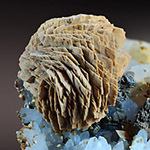 Aragonite is the less known cousin of calcite. Despite the lack of popularity, aragonite crystals and stalactites are among the most aesthetically-pleasing mineral specimes. Aragonite is present in various hydrothermal environments and it is the principal component of mollusk shells, coral skeletons and pearls. 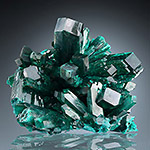 Beryl is extremely popular mineral, which occurs in a diversity of shapes and colors. Popular gemstone varietes include emerald, aquamarine and heliodor. 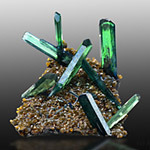 Beryl is the only common source of beryllium, which is used in many hi-tech applications. 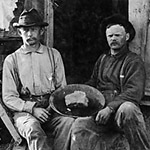 The Klondike (Yukon) Gold Rush holds the record as one of the shortest-lived mining booms ever, lasting a scant 2 years, from August 1896 to September, 1898, when it was undermined by the slightly longer-lived Nome (Alaska) Gold Rush (September 1898 to 1905). Dioptase is a secondary copper silicate, occurring naturally as an oxidation product of hydrothermal copper deposits. It is renowned as a spectacularly colorful rival to emerald, but is too soft and too fragile to be cut as a gemstone, mainly because of its perfect cleavage. Siderite is both an iron ore and gangue mineral. Its principal economic value lies in its high iron content and the absence of process contaminants such as sulfur or phosphorous. 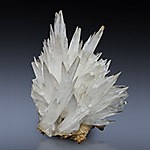 It is part of a large group of isomorphous minerals, the calcite group carbonates, which share similar physical properties, and rhombohedral crystal form. 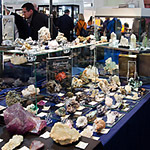 Munich show is the important European mineral show. Munich 2016 was definitely worth to see, many new minerals, many old friends. The exposition of the Alpine minerals was very nice, as well as wide selection of minerals for sale.